How I write my “items” columns generally is that I write items as I get information, then compile columns based on what’s pressing, what fits or what goes together well. This means that sometimes items get pushed off from one column to the next, or the next, or sometimes semi-permanently (or until they’re out of date, now and then). To end 2014, Wednesday’s column compiles three items written anywhere from last week to a couple of months ago. 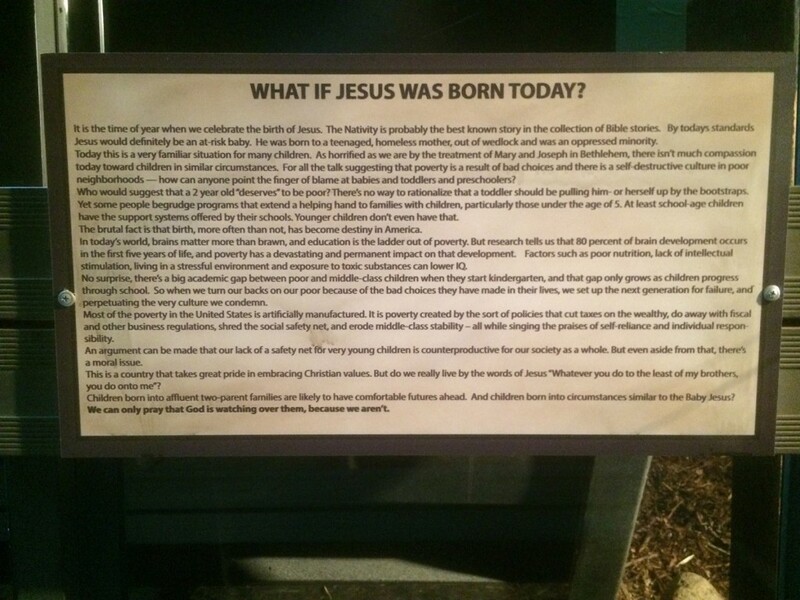 The first is the most recent, one last word about my Washington, D.C., trip. 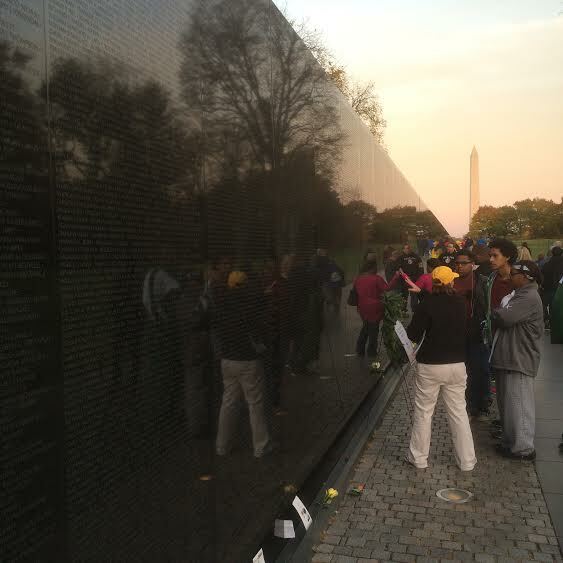 Above, the Vietnam Veterans Memorial Wall, with the Washington Monument in the background. Does anyone still buy CDs? Some of us do. You can find my Top 10 CDs of the year — my Top 15, actually, as I added five runnerups — at our IE Music Now blog, along with the picks of my newsroom colleagues Liset Marquez and Wes Woods, both of whom are hipper than me (even though they still buy CDs too). Zagat has posted kind comments and a video about the New York City restaurant Upland, calling it “this year’s hottest restaurant.” You can read and watch that here. 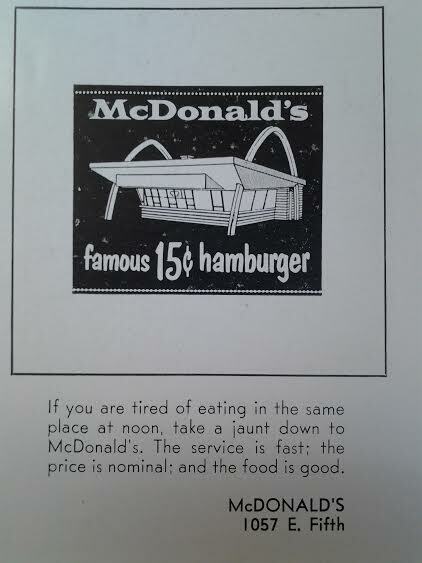 This ad appeared in the 1956 Pomona High yearbook. This McDonald’s had opened in September 1954 and was by some reckonings the seventh in the fledgling chain; it’s now Ama Donuts and 5th is now known as Mission Boulevard. Ernie Arutunian of Upland, who was in that graduating class, showed me the yearbook. 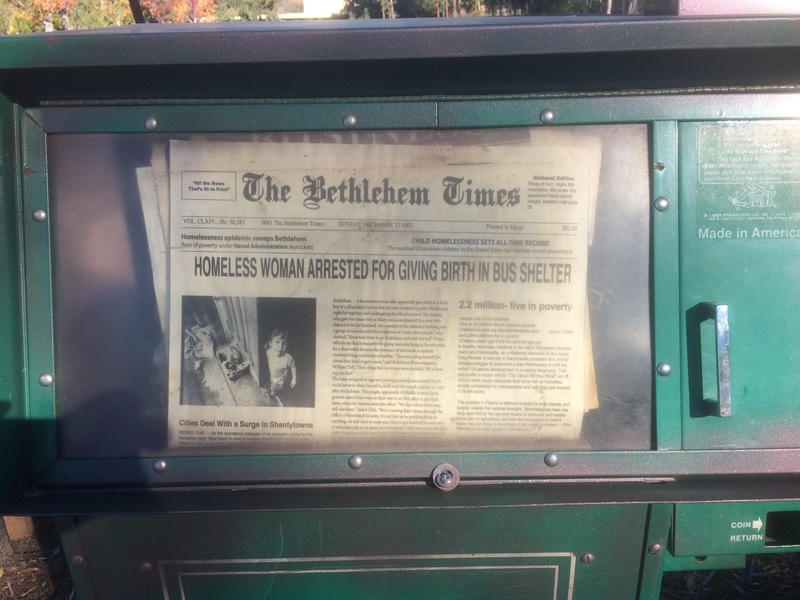 My annual countdown of the year’s 10 strangest local news stories is the subject of Sunday’s column. Replacing La Palmita, a long-lived but tired restaurant across from the Grove Theatre in downtown Upland, Genoveva’s opened in April. The owner, Hilario Rodriguez, has years of restaurant experience and is known downtown from his days managing Molly’s Souper. A friend and I ate there after the Christmas parade. The restaurant was nearly full, including the large patio, on that sunny afternoon. The interior is much as I remembered it from the La Palmita days — tile floors, arches over the entrance to the tiled patio — but maybe cleaner and brighter. I had a breakfast dish, chilaquiles ($9), which are scrambled eggs with lightly fried tortilla strips and green salsa (or red, your choice), rice and beans on the side. The sides were nothing special, but the entree was pretty good. It was also pretty big, and I took half home. 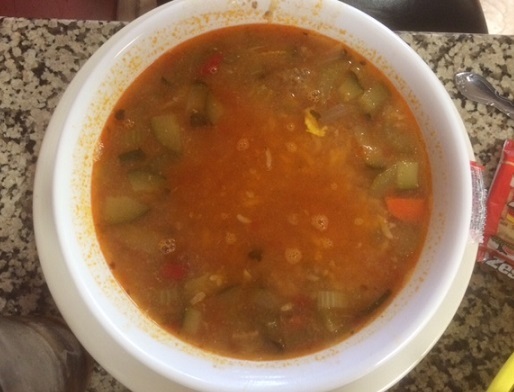 My friend got a bowl of albondigas soup ($7), which he said was excellent; he’s also had the menudo, of which he said: “It’s a clean menudo as opposed to a greasy menudo.” So noted. 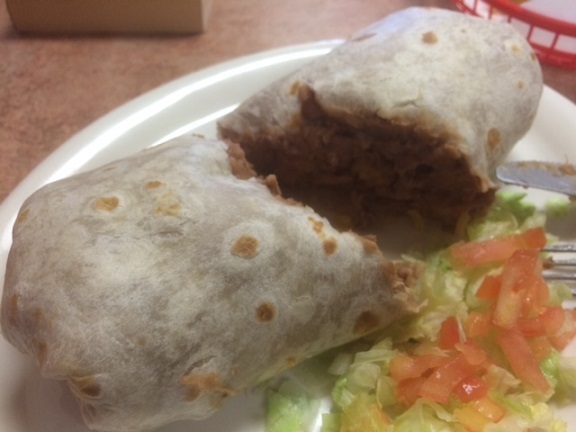 I returned a few days later to try a lunch entree, ordering a carnitas burrito ($8). You could get a burrito of equal or better quality at dozens of other places around the valley, but it was tasty, and also large, and I took home one-third. My two meals turned into four. 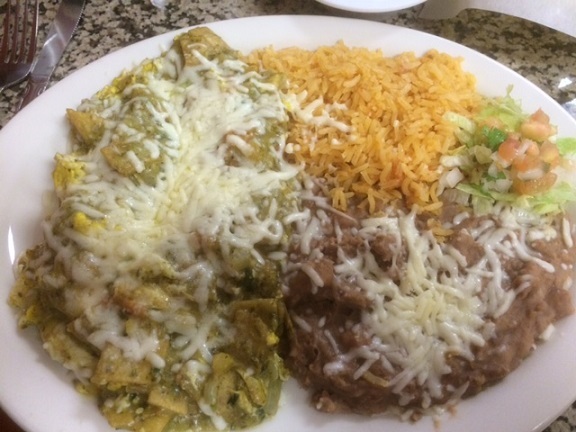 Genoveva’s is said to use family recipes from the state of Puebla, although the menu is made up of fairly standard items other than a pollo en mole. 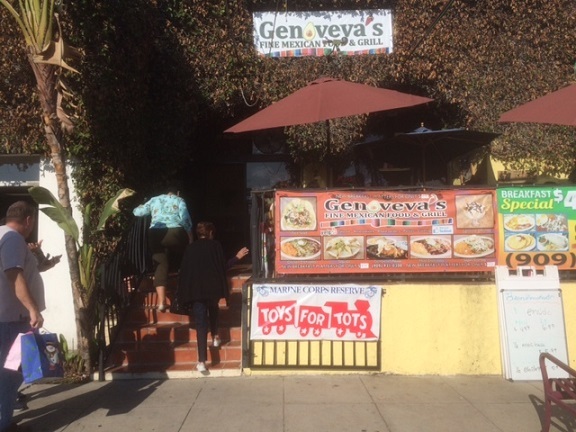 Genoveva’s isn’t as good as Elvira’s nearby in Upland, but it’s not bad, and it’s a nice addition to downtown. Karen Comstock is the new police chief in Chino. 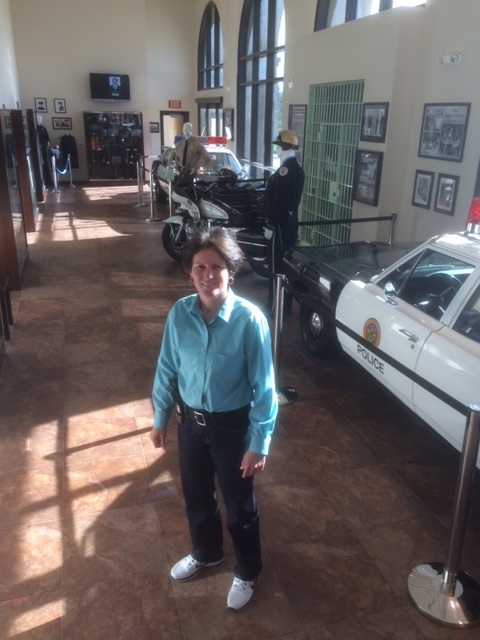 She’s not only Chino’s first female police chief, but the first in any Inland Valley city. She’s the subject of my Friday column. Above, she’s seen in the police station’s museum, filled with memorabilia of the 1926-established department’s history. 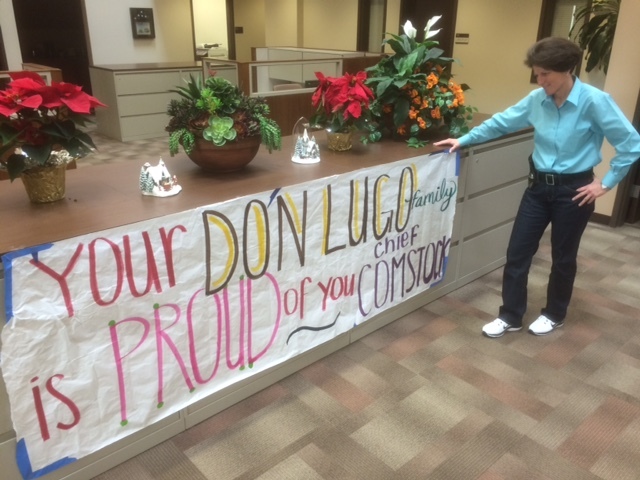 Below, she admires a handmade banner created by her alma mater, Don Lugo High, which was on display outside her office. 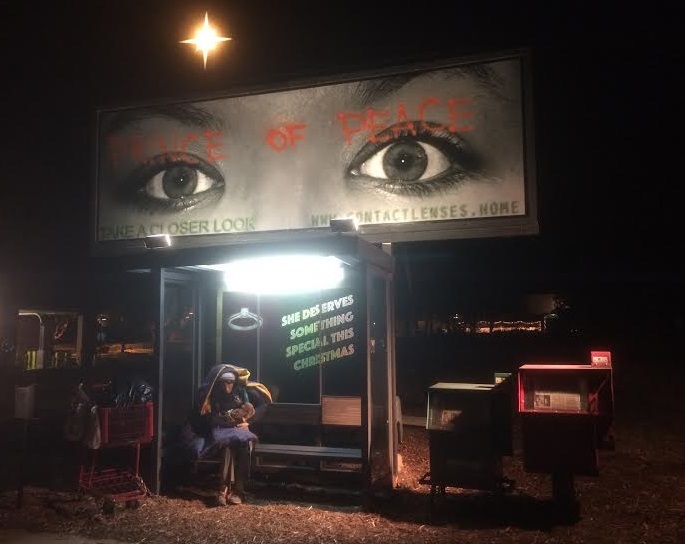 It’s not Trayvon Martin this year, but a Claremont church’s Nativity scene again takes a modern approach, depicting Mary as a homeless mother finding shelter at a bus stop. 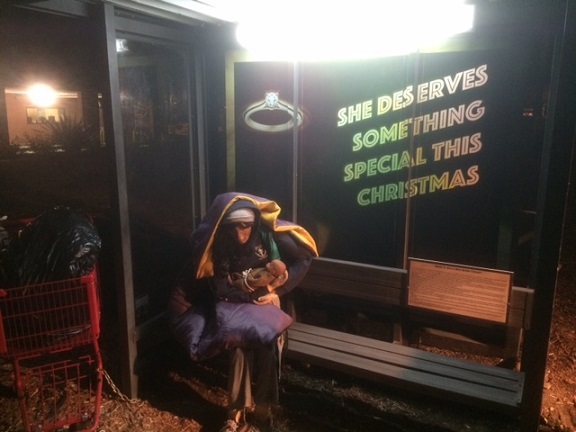 Wednesday’s Christmas Eve column tells the story. For more of the story, click on the two bottom photos to read the text of the essay and the “newspaper” story. 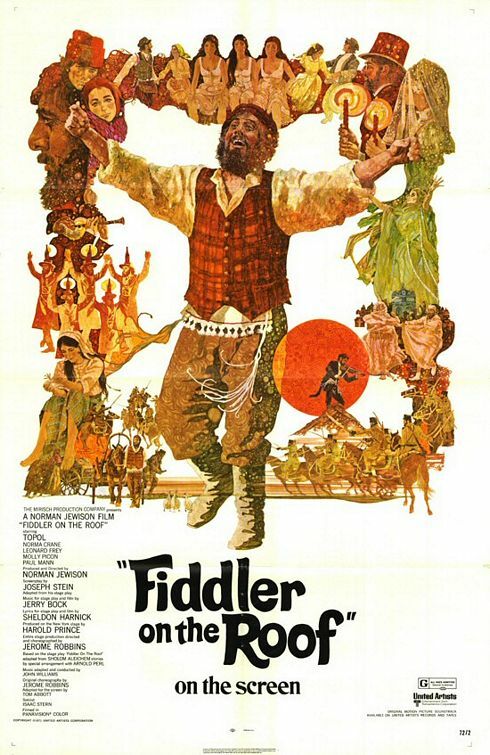 The Laemmle theater chain’s seventh annual “Sing-Along ‘Fiddler on the Roof’” will screen at the Laemmle Claremont 5 at 7:30 p.m. Christmas Eve. Lyrics will be provided to the film’s songs, which include “Tradition,” “If I Were a Rich Man,” “To Life” and “Sunrise Sunset”; trivia and prizes are promised and attending in costume is encouraged, if your wardrobe runs to early 20th century Russian village attire. Admission is $18, or $15 for seniors. The movie lasts (ulp) three hours, by the way. 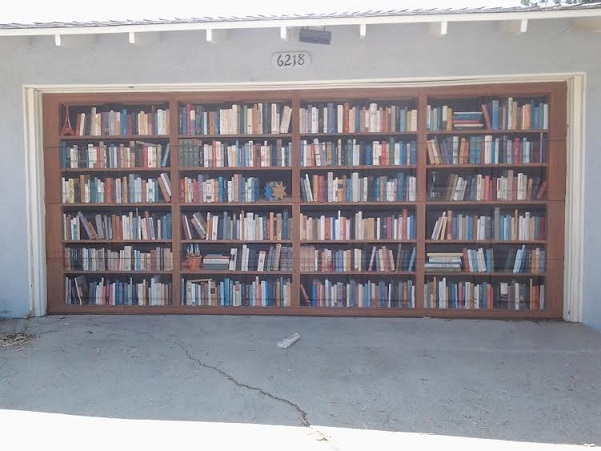 On a hike earlier this year in the Hollywood hills, I was impressed by, and envied, one homeowner’s clever garage door mural depicting shelf after shelf of books. 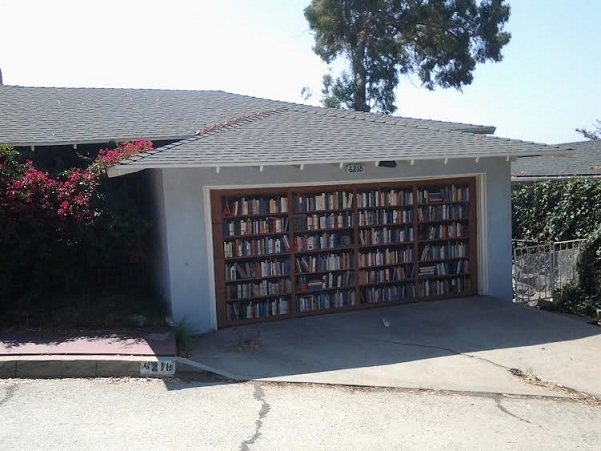 Note the (real) newspaper in the driveway!